Many customs and celebrations can be traced back to the pre-Christian time. It is the most easy transition from one faith to the other when you use the old rituals and habits from the previous faith and try to fit them into the new one. This way, the new Faith could be introduced easier. This also took place in northwest Europe during Christianization. Many traditions and holidays within the Catholic church can be traced back to a Germanic, Roman or Celtic origin. One of those holidays is All Saints Day. (November 1), when the Catholic church commemorates all the deceased. During the persecutions of the Christians in the Roman empire, many Christians were murdered because of their faith. The honorary title martyr was given to those victims. (martyr comes from the Greek word martus, which means witness). The commemoration of these martyrs is the origin of All Saints and was celebrated on May 13 during that era. In 732, the pope Gegorius III changes the celebration to All Saints Day, not only by commemorating these martyrs but also by commemorating the saints. Nowadays, not only are the martyrs and the saints being commemorated, but it also has turned into a celebration at which all the deceased are being commemorated. Because this was a period in which they still used old traditions, the Christianization was still happening, this date was not easily accepted because it did not fit into old traditions. To get out of this deadlock, Pope Gregorius IV decided to move this date from May 13 to November 1. November 1 was originally an important Celtic holiday, known as Samhain. On this day, the new year was celebrated. This had everything to do with the transition of spirits into the ghost world of the deceased ancestors. These last would be wandering about at Samhain, so say the stories. Many stories have been written about Samhain, the most fantastic fabrications, but the core of everything is and stays that the world of the spirits is very important at this day. Moving the date to November 1 was a wise decision of the pope because the meaning of this celebration suited better with the original meaning of that Celtic holiday. 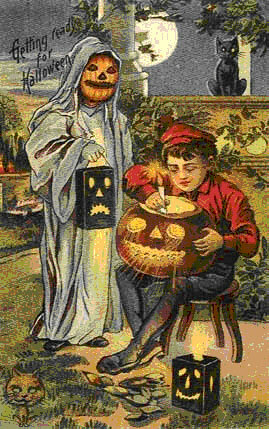 The name Halloween was born when many Irish and Scots immigrated to America and brought with them many Celtic traditions. The English name All Hallow`s Eve(ning) soon was altered into Halloween. Even with the description found in almost every article about All Hallow`s Eve of Halloween, these articles have never explained why this, out of all holidays, is the most important holiday at which the spirit world is being honored. Most of the times, they explain this by stating that at this day the end of the summer season was celebrated and that this is a transition to darker and colder winter days. Never is explained what this has to do with the spirit world. They are all isolated stories, which can barely linked to each other. After all, how can we explain that it is a celebration at which in the start of November the cattle is brought indoors and that people withdraw into their houses? If the Celts would celebrate the new year at this date, Samhain had to be a promising start of something new. When choosing a date, it is vitally important that we use the calendar regulation. When we chose November 1, we use the Julian calendar, after all, this was used during the reign of Pope Gregorius IV. At this point, we can start to wonder things. During the time of the Celts, there was no Julian calendar. If we look to three other important Celtic holidays, then these are being celebrated at Frebuary 1 (Imbolc), May 1 (Beltane) and August 1 (Lughnasad). If we go back in time for a moment, back to the time of the reign of Julius Cease. In 46 BC, Julius Ceasar has implemented some calendar changes. At this point, he was still at war with the Celts. It is therefore implausible that he would have taken the Celtic holidays into consideration so that they are all at the first day of a month. I can conclude from this that the dates never corresponded with the actual Celtic dates. A second point is that the dates are all in one year, and that there is no relation with a solar cycle. It would make more sense that the most important holidays would have been linked to dates as March 21 (vernal equinoctial point), June 21 (summer solstice), September 23 (autumnal equinoctial point) or December 21 ( winter solstice). I therefore have been looking for other possibilities which the Celts have used in their calendar regulation. This is the star Sirius. If we include Sirius into the solar cycle, we get completely different dates. Then, we can split the year into four parts, at which the sun is at the highest point of the day and at which the rising of Sirius are important. Because these dates are dependant of the degree of latitude, I have chosen Paris as the heart of the Celtic territory for my calculation. Samhain: October 4, Sirius rises 12 hours later/earlier than the moment at which the sun is at the highest point. Imbolc: December 29, Sirius rises 6 hours later than the moment at which the sun is at it the highest point. Beltane: March 31, Sirius rises at the moment that the sun is at the highest point. Lughnasad: July 2, Sirius rises 6 hours before the moment at which the sun is at the highest point. I have to note that these dates would differ for the Celts per degree of latitude. The determination of these dates would probably have been a task for druids as they had astronomical knowledge. At Samhain, Sirius rises at midnight. If Sirius would have been an important star for the World of the Gods, then this midnightly hour would be used for this. However, to explain why this date was linked to the new year, we have to look for another reason. 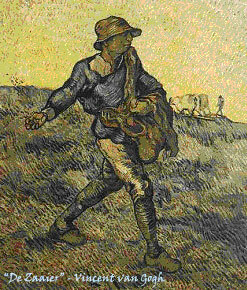 The Celts were mostly farmers. That means that their rituals and traditions would have been tuned to this. If we look at the date of Samhain, and if we link an important agricultural activity with this, it would be the sowing date for winter grains. In my article about the dodecahedron, I have discussed the optimal sowing date of winter grain elaborately, and I have also explained why this grain is preferred over summer grains. From my research for the function of the dodecahedron, it showed that the optimal sowing date in the Roman time would have been the end of September. The sprouting of the seeds will happen shortly after the sowing date, and that would mean that the celebration of this would also have happened shortly after the sowing date. With this, the link with the spirit world can easily be made, and also with the start of something new. The grain of corn after all needs to die in the ground in order for it to give new life, the new grain. This all happened in the same soil in which the dead were buried. In the period that the winter grain is about to sprout, the death, rebirth and new life are clearly present. It is not surprising that during this time, the transition from death to new life in the spirit world was important. By making the sprouting the center of attention during Samhain, the link with the spirit world, and with something new can be explained more logically. Shortly summarized, Samhain was used by the Celts to celebrate the sprouting of winter grain. For convenience sake, I assumed that the Celts would use a calendar regulation for their holidays. For a holiday like Samhain, it is not necessary to use a calendar regulation. One could also use the rule that Samhain would be celebrated two weeks after the sowing date, or any other period that is necessary between the sowing and the sprouting date. As a sprouting date, one could also chose the moment at which the small plants would start to get visible on the fields. The period between the sowing date and the celebration of Samhain would be longer in that case. From my hypotheses, it can be concluded that I do not portray the Celts as an undeveloped race, but as a people that is close to nature, and that therefore, their most important holiday is adapted to it. Historians have depicted the Celts as barbaric, and have used the most horrific habits as examples. We have to use caution when discussing this, because the Celts have concentrated their knowledge with a relatively small group: the druids. The druids were Celtic priests, which had a high rank in the Celtic society. It was not allowed for the druids to write any of their knowledge down so the only way to have a transfer of knowledge is verbal. 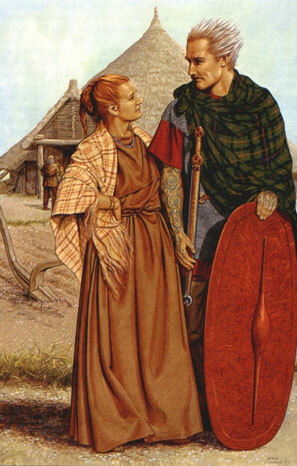 This would mean that what we know of the Celtic culture is limited and we cannot verify descriptions of their culture. Often, the "Book of Celts" is being used to dictate from, but that book did not appear until the 9th century, and we can wonder how accurate these stories from the Celtic period are if they would have been written down about 900 years later. For that matter, we have to remain critical with examples about the Celts that Julius Ceasar uses in his book "The Gallic war". We do not need to go back in history that deep to prove that some leaders haven`t had any problems with massacring entire population groups. With ideological, economical or political reasons they tried to convince the population of the need for the massacres. Julius Ceasar would have had personal motives for his urge to concur the entire north west of Europe, slaughtering a large part of the Celtic population, or transporting them back to Rome for slavery. To prevent criticism, he will not describe the Celts as highly civilized people.